I don’t know about you, but in my house we have a kitchen cabinet that’s practically overflowing with delicious aromatic herbs and spices. We love how adding a dash of this and a sprinkle of that can totally change the taste of a meal. But what many people don’t realize is some of those very same herbs and spices you use to dress up our dinner can also be used to jazz up your health. In fact, I’m willing to bet you have a at least a few of these healing spices in your own kitchen right now. Today I want to shine a light on five of my favorites…. There are few American kitchens that don’t have a shaker or can of black pepper in them. Pepper is actually one of the oldest spices known to man, and is still one of the most widely used around the world. You already know that black pepper can spice up a meal, adding a delicious fiery bite to your dishes. But I bet you didn’t know that this ancient spice is a digestion star too. Black pepper kick starts saliva flow (making foods literally mouthwatering), fuels your digestive juices and stimulates your digestive organs. Heck, this hard working spice can even help quell indigestion and flatulence. And if you’re taking curcumin for inflammation (see “Turmeric” next) you’re going to want to keep some black pepper on hand, because this wonder spice will help your body absorb the curcumin and put it to work. Curcumin is an anti-inflammatory substance found in the spice turmeric. 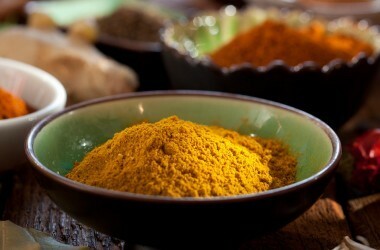 Curcumin is clinically proven to fight cancer, making it a great herb for current and former smokers to use. Curcumin’s powerful anti-inflammatory properties also make it an excellent choice for anyone suffering with carpal tunnel syndrome or arthritis. And it may even help ward of cataracts. Turmeric is packed with free-radical fighting antioxidants, including vitamins C, E, and E.
Oregano isn’t just delicious sprinkled on your favorite Italian dishes, it’s also a potent antiseptic. In fact, the herb is brimming with at least 19 antibacterial substances! In other words, oregano can help fight off all sorts of harmful bacteria and organisms to help you get healthy and stay that way. Oregano calms stomach muscles making it another herb that can help with digestion, And it contains four cough soothing compounds as well. But perhaps most impressive of all is that oregano could help you reduce your blood pressure. Garlic is a real powerhouse herb. It can help relieve digestive complaints such as diarrhea, and like oregano, garlic is a terrific natural antiseptic. But bugs are far from the only thing this fragrant herb fights. Garlic is also heart friendly, helping to fight hypertension, lower cholesterol levels, and reduce plaque. It even wards off hardening of the arteries (atherosclerosis). Cinnamon has so many healing properties it’s tough to even know where to start. This delicious warming herb has been shown to help lower blood pressure. It can help tame an irregular menstrual cycle. And it has even been found to be an effective natural anxiety and stress reliever. Cinnamon is also a top notch bacteria killer, smashing dangerous bugs such as Salmonella, Staphylococcus aureus and E. coli. These five favorites are just the tip of the iceberg. Nature has provided us with literally dozens more healing herbs and spices that are waiting out there for you to discover them. 1. “Black pepper and its pungent principle-piperine: a review of diverse physiological effects.” Crit Rev Food Sci Nutr. 2007;47(8):735-48.